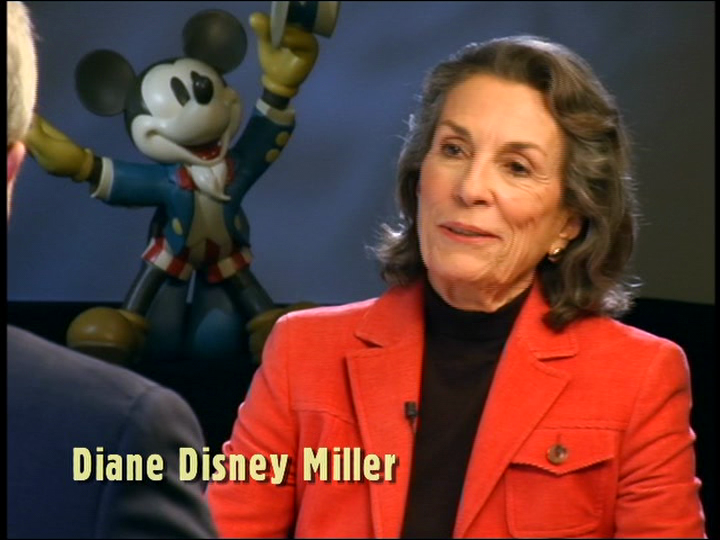 On December 18, 1933, Diane Marie Disney Miller was born in Los Angeles, California. Walt Disney was accepting an award from The Parents Magazine for “distinguished service to children,” when he was given the news that his wife Lillian was in labor; he murmured his thanks to the guests assembled and ran out the door to join his wife and welcome his daughter. Diane was the first daughter of the Disney family; sister Sharon was adopted by the family in 1936. At age 20, Diane met Ron Miller on a blind date in San Francisco; the two married on May 9, 1954. After serving in the Army and playing professional football, Miller would work at the Walt Disney Company, eventually serving as CEO. In 1984, Miller left the entertainment industry, and he and Diane opened the Silverado Vineyards Winery in Napa, California. After dedicating her life to raising her family, Diane became a fierce advocate of her father and his legacy. She helped document the history of Walt and the company, especially with the creation of the Walt Disney Family Museum, which opened in 2009. Diane was also instrumental in the development and opening of the Walt Disney Concert Hall in 2004. Known for her fierce protection of her father’s legacy, she was honored for her efforts to preserve the history of Walt Disney and the company for nearly two decades. She continued to fight against inaccurate biographies and rumors circulating her father, and in 2001, she assisted the Walt Disney Family Foundation in creating a documentary film entitled The Man Behind the Myth. On November 19, 2013, Diane passed away after sustaining injuries in a fall. She is survived by her husband, seven children, 13 grandchildren, and a great-granddaughter. Posted in Uncategorized and tagged 1930s, Births, Disney, Legacy, Walt Disney, Women. Bookmark the permalink.